The atmosphere of our planet Earth is a multilayered composition of gases, primarily Nitrogen (~78%) and Oxygen (~21%), but also includes a much lesser amount of other gases, one being Carbon Dioxide. A number of these gases trap longwave radiation coming off the surface of the Earth as a reflection of the shortwave radiation coming in from the Sun, causing heat energy to be retained. 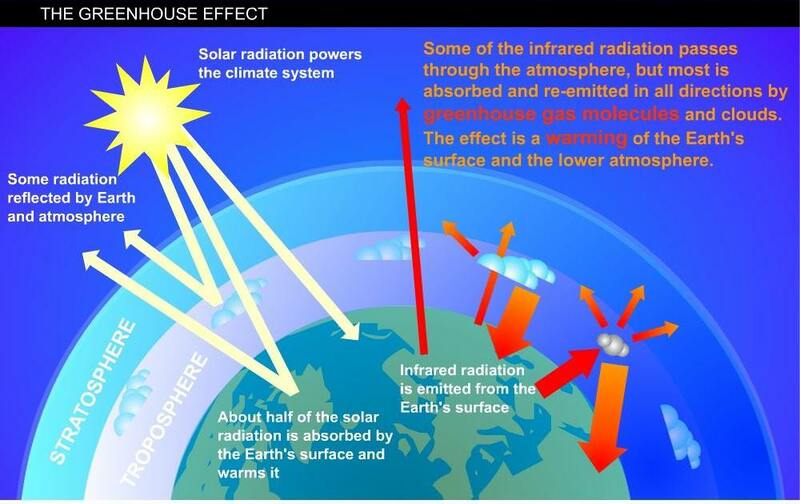 This is the ‘GREENHOUSE EFFECT’ which has evolved over time and regulates the temperature of the planet in a way that allows it to support life. 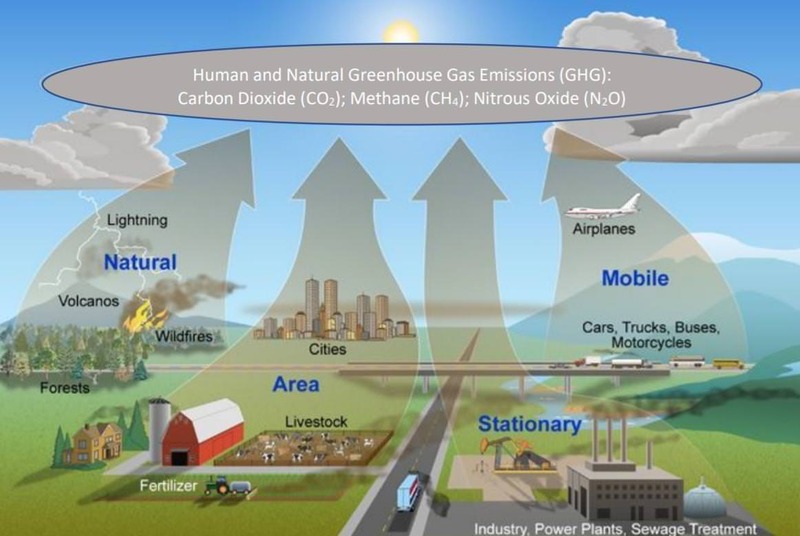 Carbon Dioxide and Methane are the key gases which act in this manner, and both are composed of Carbon based molecules. As more Carbon Dioxide and Methane is added to the atmosphere, the earth heats up. Carbon Dioxide is the gas primarily increased by fossil fuel combustion. We have come to refer to the amount of carbon we put in to the atmosphere and the ocean as our ‘CARBON FOOTPRINT’. In light of the fact that oxygen itself is not a heat trapping substance unless in the form of Ozone (O3), Carbon has become the major focus of concern as the most damaging component. Although there has been natural fluctuation over time, pre-industrial levels of CO2 remained fairly constant, and a balance existed which regulated the biosphere temperate so that life could flourish as we have come to know and study it, as well as be part of it ourselves. Pre-industrial levels of CO2 ranged between 260 and 280 parts per million (ppm). With the advent of industrialization and the extensive combustion of coal, the CO2 ppm began to climb. By the mid-20thcentury, and due to the increases of combustion of refined oil products such as gasoline and diesel, it had reached approximately 300 ppm, and by the last decade had reached 350 ppm, and was still climbing. Today if you go the NASA website focused on climate change, you will see that it now sits at 407 ppm. Carbon levels have never been that high in all the time that humans have existed. This is dangerous territory for life on our planet, a fact agreed upon by close to 100% of all the world’s climate scientists, who send a collective warning that if we do not drastically reduce our carbon emissions soon, we will reach a tipping point where little could be done to stop continued heating of our planet. In other words, the solution to this potentially catastrophic problem will be beyond our control, or even our ability to have any significant effect. That’s what CARBON has to do with it!